Doubt and uncertainty may be important ingredients for stability in Western societies, helping them avoid the dangers of fundamentalism and relativism, according to a new book by sociologists Peter Berger and Anton Zijderveld. In their new book In Praise of Doubt (Harper Collins), Berger (Boston University) and Zijderveld (Erasmus University) argue that modern life contains the seeds for both fundamentalism, or ideological intolerance, and relativism. Unlike most critics of fundamentalism, the authors cast doubt on the view that modernization implies greater secularization or loss of religious vitality. They cite evidence showing an increase of religious belief and practice around the world. Even in two exceptions of Europe and among elite intellectuals, there are stirrings of spiritual interest, although usually outside the boundaries of traditional religious institutions (such as the New Age movement). Berger and Zijderveld write that modernity does increase the pluralism in society, both on religious and moral grounds. The greater plurality of values and religion may result in what the authors call “cognitive contamination,” a situation where one’s taken-for-granted view of reality become shaky after exposure to other viewpoints. This process can take place between groups, which is usually known as syncretism, as well as between individuals. While religions can survive and even thrive under pluralism, the condition increasingly renders belief a matter of choice rather than obligation. The greater pluralization of moral values is a more serious threat to society, write Berger and Zijderveld. While it may be possible for a Catholic and Protestant who hold different views on communion to get along together, differences on moral issues, such as the practice of honor killings or polygamy, can cause a serious rift in society. Such a pluralism of values, which is becoming a reality in many European societies welcoming immigrants, results in “relativization,” or the loss of certainty to one degree or another. In extreme cases, this loss of certainty can lead to relativism or a questioning of the idea that any objective truth can be reached. The loss of certainty and the insecurity it generates can also drive people to the opposite extreme of restoring absolute doctrines and worldviews, which is known as fundamentalism. Berger and Zijderveld add that fundamentalism need not be only religious; there can be fundamentalisms of science or even “postmodern” relativism itself. The authors argue that doubt represents the important middle ground between relativism and fundamentalism, although they note that certain core principles, such as the value of human life, should be non-negotiable. Such a position on abortion would avoid the “culture war” rhetoric of the prolife and pro-choice camps; while one would not have the certainty that abortion is the taking of a human life in all cases , neither could one argue that women have freedom over their bodies that would trump all restrictions on the practice. The balance between certainty and doubt is expressed in an “ethic of moderation” that best functions in democratic societies, according to Berger and Zijderveld. For instance, on the thorny question of Muslim immigrant rights in Europe, the authors argue for a position of “triage” that allows for such practices as wearing head scarves in public places and respecting the religious obligations of Muslim employees, while enforcing the law against honor killings, polygamy and other practices that would clash with the value system and historical culture of the host societies. 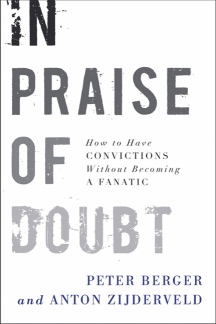 Peter Berger and Anton Zijderveld, In Praise of Doubt: How to Have Convictions Without Becoming a Fanatic , Harper Collins, 2009, 192 pages.